Show off your strength, courage and will to win by attaching this Ovarian Cancer Awareness Key Chain to your keys. Our awareness key chain makes an ideal gift for survivors, warriors and advocates and shows that you will stop at nothing to find a cure. 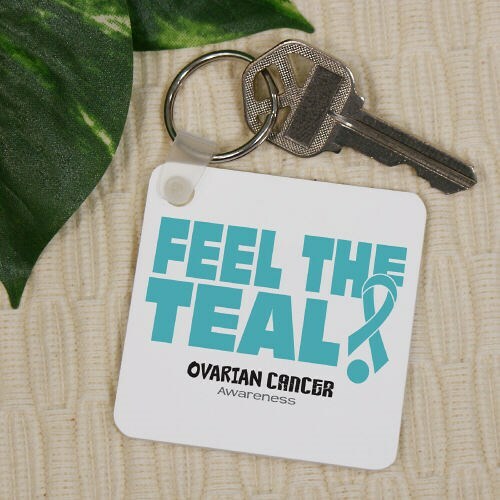 Our Feel The Teal Cancer Awareness Key Chain is ideal for any Ovarian Cancer survivor, warrior and advocate because cancer awareness matters. Our Key Chain measures 2¼" x 2¼" and is a ¼" thick. Each Key Chain is made of plastic and includes a key ring. Additional Info Ovarian Cancer Awareness Month is September. Help us in showing support for this great cause by wearing Ovarian Cancer Awareness Apparel & Walk Gear from MyWalkGear.com. You'll find our collection of eye-catching gear to be an excellent choice for your awareness apparel. Be sure to also view our Ovarian Cancer Awareness Water Bottle & our Ovarian Cancer Awareness T-Shirt as well.